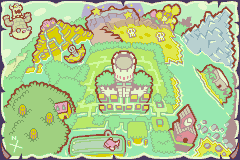 This article is about the location found in Mario & Luigi: Superstar Saga. For the series of animated shorts from Poochy & Yoshi's Woolly World, see Yoshi Theater (Poochy & Yoshi's Woolly World). 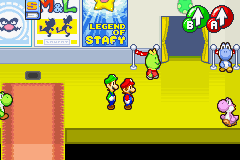 The Yoshi Theater is a theater located north of Beanbean Castle Town in Mario & Luigi: Superstar Saga. It was built specially to honor the Yoshis. Boddle, Bubbles's brother, is the curator. After the Mario brothers obtain the seven Neon Eggs, received after feeding seven different colored Yoshis with Bean Fruits, Boddle places them on the sign and the Yoshi Theater opens while the Yoshis celebrate. 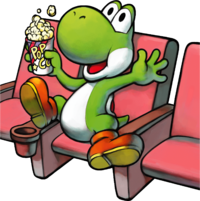 The Yoshi Theater is the only place to see Yoshis in the game, not counting the ending, when it is revealed that they were watching the whole adventure as a movie. The theater also appeared in the 3DS remake, Mario & Luigi: Superstar Saga + Bowser's Minions, with the same purpose as the original game; only this time, the Yoshis watching the game as a movie are seen in a pre-title intro cutscene, instead of the ending. The Yoshis are also seen watching the events of Minion Quest: The Search for Bowser unfold. All of the movies showing at the Yoshi Theater are based on games within the Nintendo universe (including Mario & Luigi itself). Legend of Stafy – Based on the The Legendary Starfy video game series. Wario – A Wario-based movie whose poster is based on a piece of artwork from the WarioWare series. M & L – It is implied that this is a movie of the very game that Yoshi Theater is featured in: Mario & Luigi: Superstar Saga. Kirby Story – A seemingly generic movie featuring Kirby. It could be a pun on Mario Story, an alternate name for Paper Mario, as this game's main plot device is the Star Rod, which initially comes from the Kirby series. In the Nintendo 3DS remake Mario & Luigi: Superstar Saga + Bowser's Minions, new posters featuring movies based on later games in the Mario & Luigi series replace the original posters. A War of the Worlds-esque movie featuring Shroob-like alien invaders. A love story starring Broque Monsieur and Broque Madame, referencing their failed relationship prior to the events of Mario & Luigi: Bowser's Inside Story. A movie starring a Cheep Cheep. A Raiders of the Lost Ark-esque movie starring Prince Dreambert. Map of the outside of the Yoshi Theater. Map of the first room. Map of the second room. This page was last edited on March 26, 2019, at 11:58.